Valkyrja were formed in 2004 and immediately started working on their own lot of original material. In March of 2005, the first aural offering was crafted under the title, Funeral Voices, a vicious 5 track EP presenting a fierce and relentless preview of what was yet to rise. Funeral Voices was re-released under a new title, Far Beyond, on cassette via Deathkrush Productions in September of the same year, including an additional 5-track studio session on the B-side. In 2006, Valkyrja went through some line-up changes, as guitarist Joakim and drummer Skall were dismissed from the band. A. Hed stepped in on guitar and J. Wallgren joined on drums. 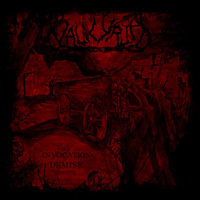 Their debut album, The Invocation Of Demise, was recorded at Necromorbus Studio in March and April of 2007 and unleashed upon mankind in September via Northern Silence Productions (CD/LP). Bass player J. Lindgren left the borders of Sweden, soon being replaced by M.A. in July of 2008. By the end of the year, Valkyrja signed a multiple album deal with Metal Blade Records. The band sees the work with these allies as an opportunity to spread their crafts even further and on a larger scale. The Swedes have thus far already marked both studio and live performances with a brutal and aggressive signet, leaving no-one that has seen or heard them in the dark about of what the band can deliver. Territories stand not yet ravished by the plague and famine that is Valkyrja, a fact this collaboration will change – a seal in Blood, Fire and Death. Contamination was born the summer of 2009, again in Necromorbus Studio with producer Tore Stjerna. The album marks the expansion of the bestial seal that brands the band’s emblem, showing them at their most violent and devious to date. Valkyrja has previously stated that they work to create songs full of ambiences and differences to make each passage a morbid journey, something that Contamination will prove to be an accurate description. The lyrical repulsions carry the proclamations of opposition and the essence of frustration and insanity, the drumming pounds the pulse of sheer violence and the guitars act as razors traveling across the spine. These elements combine as one to surely make Contamination an early metal highlight in 2010.